Revisiting this mess, from the beginning I’ve said something doesn’t pass the smell test here; call it an Islamic conspiracy if you will. I still believe dear old dad (Mohamed Elhassan Mohamed) decided to use his son to game the system. One, he wanted to promote Islam; two, shame/scare the infidels (into silence); and three, make a little scratch on the side (if not lots of scratch). My guess, it this is a case of “civilization jihad”. This is an actual thing, pushed by the Muslim Brotherhood and other terrorists encouraging sympathizers to use the freedoms of the West against the West. These attacks are meant to weaken western civilization from within. With the help of the left… they are actually quite effective, especially when applied in the northeast or left coast… no so much in Texas. With that in mind I say when Ahmed Mohamed (the son) left for school that morning he had clear instructions (from dad) not to come home without causing a scene or worse. The fact that worse happened was just icing on the cake for these miscreants. The “clock” wasn’t “invented” so much as a fully functional and working clock being taken apart and reassembled in a pencil box (by the boy “genius”). 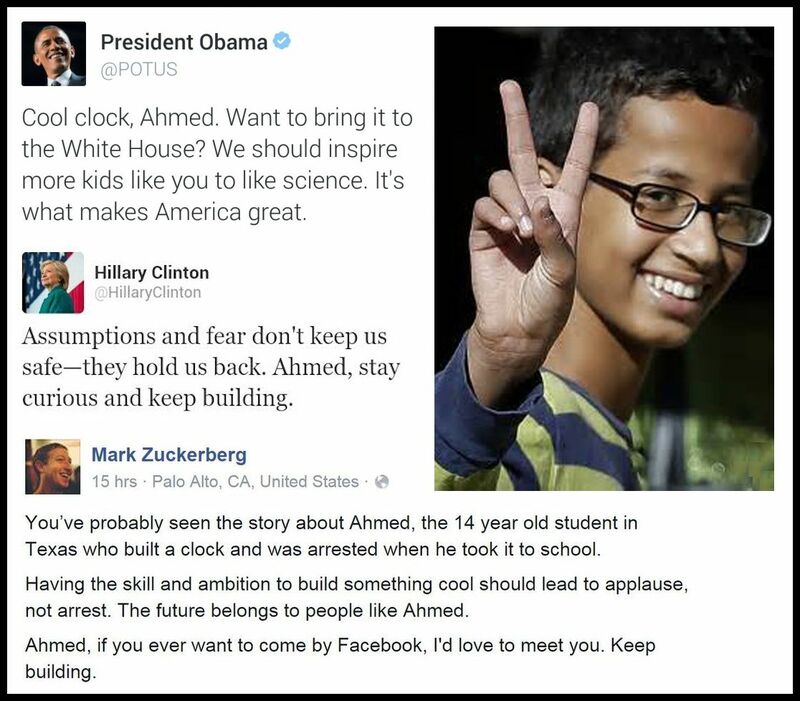 When a teacher earlier in the day was shown the “clock” he instructed the student (Ahmed) to put it away and not… NOT… to show it to anybody else. 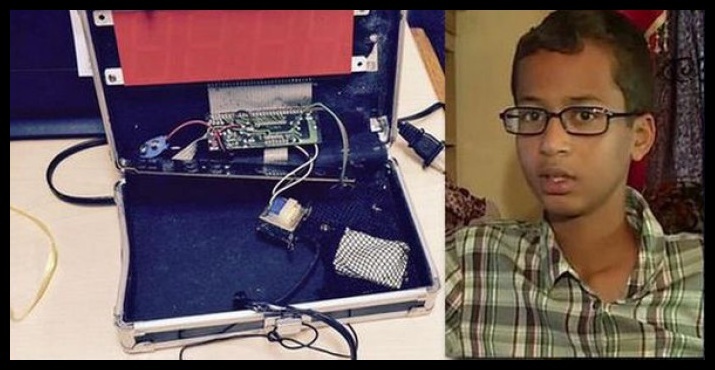 Little Ahmed (the genius inventor) did just the opposite. Even making sure an alarm triggered later in the presence of another teacher. Now, as this is all playing out, Mohamed is discovering his one miscalculation in all of this… TEXAS. It fills me with great pride that we (Texas) can be the state to tell Mohamed to go $%#@ himself; preferably in Qatar surrounded with the terrorists buddies he’s been hanging out with for the past year and a half. But this problem goes beyond this particular Mohamed. We see here an issue with Islam overall that has been perplexing the west for centuries. That being, lying and deceit is a central tenant of Islam. Sure followers will point to verses in their holy book that say be honest and tell the truth, BUT… Muhammad (the “prophet” and by extension Allah) only require honesty when dealing with other Muslims. When dealing with infidels pretty well anything goes as long as you’re promoting Islam. The phrase “it will be forgiven you” seems to come up repeatedly. Look, I’m not saying all those that practice Islam are lying weasels; I’m just saying that the founder of the “religion” said it was OK to be lying weasels. I guess I’m also saying Mohamed Elhassan Mohamed (and by extension his son Ahmed) are taking Muhammad’s (the “prophet”) teachings to heart and thus are in fact… lying weasels. I would really like to see some “moderate” Muslims stand up and point out that these miscreants don’t represent them or their faith; but I won’t hold my breath. First of all, because they do represent Islam… perfectly; and second, because “moderate” Muslims are kinda like the moderate Germans leading up to WWII… invisible, silent, and inconsequential. Mohamed Elhassan Mohamed has gamed the system with the help of his son and the American left. He’s got plenty of goodies for his efforts so far. Meanwhile, Texas has just given him (and the leftist) the middle finger when it comes to a big legal lottery ticket. I say we (Texas) keep that up. And let’s make it perfectly clear that we would just as soon see the Mohamed’s not darken our door (all of Texas) again. Might we suggest that the left coast (California), north east, or Middle East will be more to their liking.